If you cast your mind back we reviewed God Is Busy... Save Yourself, an earlier album from Wicked King Wicker which pitted doom metal with noise. Back on Cold Spring, some four albums later, Wicked King Wicker throw up this prime slice of slo-mo blackened doom with lashings of noise and atmospheric effects. 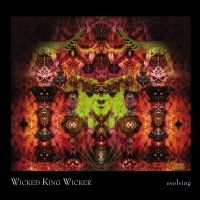 Evolving is only four tracks long but boy do Wicked King Wicker know how to pile on the pressure with their doom riff, black ambient soundscaping and post-industrial noise and frequencies, with rhythms that are times almost dub informed. In places Evolving draws comparisons with Khanate, Sunn o))) and the likes of Greymachine, Ice, Ramleh, Skullflower and Merzbow. Evolving is that good. Why they're not way better known is beyond me. Evolving kicks off with 'The Devil Must Learn The Limitations Of The Host' which features a devilish concoction of rattling almost dub rhythm, earth shaking vibrations and blackened airy explosions, as growled horrorcore murmurings are summoned from some Stygian depths. It hardly sets the tone for Evolving as things just keep getting heavier and denser. 'A Prayer For Death', the following track, is a monstrous thick slab of monolithic doom; a slow crawl of ravaging noise, riddled with frequencies and distant holler. The heaving riffage that lurks underneath the thickened textures may prove that Wicked King Wicker operate in doom circles but their penchant for noise, find its roots in the early noise circles of the UK. Listening to this, I'm convinced that Wicked King Wicker are well familiar with Whitehouse and the Broken Flag discography. 'A Prayer For Death' is a thrilling take on noise and doom, as it relentlessly pummels and develops to create a coruscating slow ride through effects laden noise atmospherics and blackened riffage that can't fail to engender delight to those familiar with the genres. God knows what those unaccustomed to these styles would make of this. 'Zen And The Art Of Nihilism' is brutally hypnotic and powerfully disturbing as a result of its searing rolling Merzbow-like skree pinned to a looped bass and hammering rhythms. It takes a while before any guitars kick in but when it does the distant riffage gets caught up in a headspin as it slowly lumbers amidst the caustic wreckage. The doomy vocal holler absent from 'Zen And The Art Of Nihilism' returns on the final track, 'The High Exalted Nothing'. Rooted around a loose low-end pummelling distorted bass and a ratchety beat, those anguished doom cries rise and dissipate, lost amidst the chaotic swellings of textured noise and frequency wash. On this track any semblance of doom metal is lost as the entire things unfurls to a blackened wall of careering psychedelic noise.